TURNKEY and GORGEOUS one owner home in the highly sought after gated community of Sandoval. Incredible water view as soon as you step into the front door of this peaceful home. Great room with telescoping sliders and french doors open to the extended screened lanai with retractable awning. Kitchen island with deep stainless steel sink, spacious granite counters, large pantry and additional seating at the island/bar. Private floor plan with the Master bedroom off the Great room, sharing the great water views, and 1 Bedroom, guest bath, and office/den located off the entry. Custom upgrades including 16" tile on the diagonal, wooden kitchen cabinets with 42" uppers, tray ceilings, 3 walk in closets, and accordion hurricane shutters. The laundry room has additional storage and connects to the 2 stall garage. 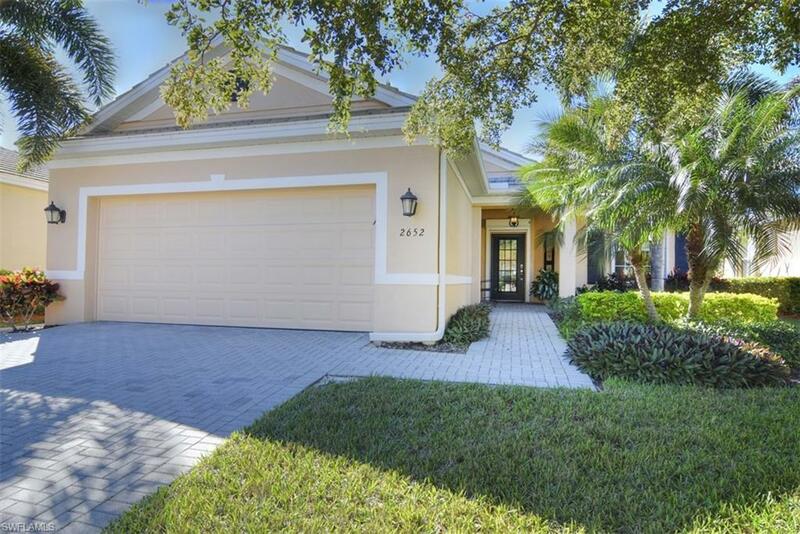 This home is beautifully decorated, meticulously maintained and comes completely furnished! Convenient location to shops, restaurants, schools, etc. The gated community of Sandoval offers a variety of recreational activities and amenities. Don't miss this one!